There are two concepts that come up frequently in science and engineering, they are precision and accuracy. Precision is roughly how detailed something is, how much information there is. 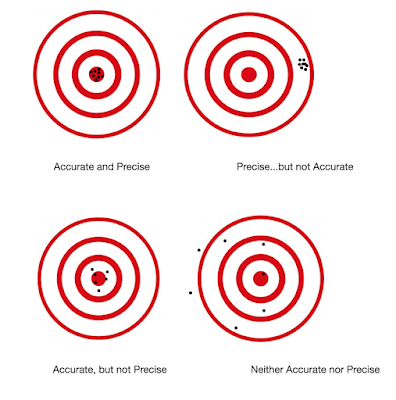 While accuracy is how correct that information is, how well it corresponds to reality. If you ask me what time it is, and I say “it’s ten forty-two in the morning” that’s a pretty precise answer. If in fact it’s 11:25 a.m., though, it was not a very accurate answer. If instead I answered “it’s eleven thirty” that is a lot more accurate. It’s not perfectly accurate, it’s off by five minutes, but on whole it’s probably a much more useful answer. Suppose your answer is “It was okay. We went to the beach”. This might be an accurate answer, if that’s what you actually did, but it’s not very precise. Given a vacation to Florida is kind of a big undertaking, this answer would be a bit off-putting, I would think to myself, well, I guess you are in a hurry, or stressed, or we maybe we are drifting apart as friends. This answer is like a tight-lipped nod. It’s not exactly rude, but it’s definitely not friendly. Instead what if you had said “It was okay, we had two nice days at the beach, it was gorgeous there. But the last two days it rained the whole time, which was a drag. And the flight back had a major delay and we got in at 2 a.m. in the morning and had to drive home, I almost fell asleep at the wheel.” This is a much more precise answer. Assuming that’s what actually happened, it’s a very appropriate and friendly response, I would feel warm about the exchange. I’m not thrilled you didn’t have a better time, but I’m reassured we were on good terms, and it leaves me feeling good. I’m hoping next time you have better news to report. This is like an enthusiastic handshake at a minimum, but really more like a friendly hug. Now suppose instead when I asked you about your vacation in Florida you answered, “We changed our plans, we went to Vegas instead. It was awesome,” even though you in fact did go to Florida. This is basically a sucker punch to the gut. You are telling me something completely false, to my face, with no remorse. This is very aberrant behavior. If I find out you lied about this, we will no longer be friends. You might claim you were joking, but then I'd just be very confused and conflicted. Finally, let’s say over some hot mochas you again tell me that you went to Vegas, but this time you launch into several stories. You say you stayed at the Bellagio, that you were on the 15th floor, you played a lot of black jack, you were up $500 at one point but you lost it all. You say saw the Britney Spears show, and in fact got to meet her back stage. She’s shorter than you’d think. On the plane home the stewardess tripped, and you accidentally laughed out loud, so she glared at you the rest of the flight. This is the equivalent of the same original sucker punch, followed by a long series of kicks and punches. I’m on the ground, and you are repeatedly kicking me in the head. This is so wrong of you. Now consider what if someone overhead us talking? And they liked the story? What if they were thinking of moving somewhere within the United States, and decided based on what they heard, and of course many other factors, to move to Las Vegas. What if they uprooted their family and moved there? To be kind let’s say everything turned out fine, but just consider the sheer number of atoms that were perturbed by that story, that story that was completely invented, that story you spun up from nothingness, propelled by the misguided squirts of neurotransmitters in your damaged little brain. People that utter lies that are inaccurate but also very precise have a grave disease. The more precise, and the more frequent those lies erupt, the worse the disease. It’s a disease of the mind, and also moral bankruptcy, when given the opportunity to do something good or something bad, they do the bad thing, but then, even worse, they hijack your attention to repeatedly do more and more bad things, completely uninvited. People like this are corrupt, they are broken. We should pity them, and have compassion, they did not choose this disease. However there are two things we should never do with these people. We should never give them a platform, because the damage they do, the cancer they spew, is limited only by the reach of their voice. And we should never give them power, because they’ve showed their cards, they revealed to us, in explicit detail, how their minds work, how defective they are. And no one with those defects, especially if this was all known in advance, should be given power.